Many call it the “blue screen of death”. This dreadful computer issue is feared by many. 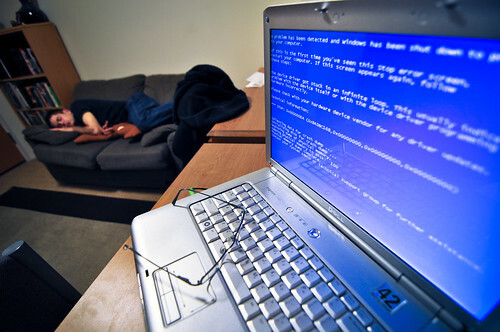 Imagine working on your computer, taking a few minutes of coffee break and then going to back to be greeted by a blue screen on the monitor. You try to move the mouse and reboot the PC but nothing happens. So what is this mysterious blue screen? Here are some useful information help you uncover its mystery. The blue screen of death (BSOD) is also known as a stop error and considered to be one of the most severe problems that Windows systems encounter. There can be many causes to this. It could be because of a software problem like a virus infection, device incompatibility, driver error or a corrupt registry. Most of the time, it is usually caused by hardware failures which tend to be much harder to resolve. When this occurs, it is possible to lose all the data you have in the computer. It can also cost you a lot of money to have it fixed as some issues would require you some of the parts of your PC. Blue screen errors generally only happen in NT based operating systems like Windows NT, XP and 2000. However, there are some reports saying the new Windows 7 system is also not immune to it. Recently, there was an outcry of help when the BSOD appeared in many different computers after installing a specific security update. Microsoft has addressed the issue and is looking further to what could have caused this. When the blue screen appears, it always comes with some information about the issue. It will come with a stop error code, which is a series of numbers and letters. This code may seem alien to most of you, but thankfully Google is here to decipher it for you. Yes, even stop error codes can be Googled nowadays. All you have to do is copy and paste the code and run a search on it. The search engine will then direct you to the websites that tell you what the code means. Each code is assigned to a specific issue and it is the computer’s way of telling you what’s wrong. Although knowing what the stop error code means will not totally resolve your problem, it is one step closer to understanding what is causing the computer to crash. Most of the websites that provide translation for the stop codes also usually provide the troubleshooting steps that you can do. Several of these techie sites and forums provide you with step-by-step instructions and illustrations as guide too. If you don’t have any experience in basic troubleshooting, you will find the steps very confusing. Most of the time, the steps will be done in the DOS command prompt if the system isn’t able to boot to Windows anymore. If all of this fails, then it’s time to call in an expert like DQSupport to solve the problems as an experience technician can frequently help you diagnose and repair this problem.